A Honda Pilot Plug-In Hybrid may be on the docket if new spy photos are to be believed. If so, the Pilot crossover will be the fourth electrified vehicle to join the Japanese automaker’s lineup. The spy images were taken during testing in Ohio. There’s no confirmed model year for when the Pilot Plug-In Hybrid will go on sale. So far, the Honda lineup includes three electrified vehicles: the Accord, Clarity, and Insight. Honda has a goal of making two thirds of its entire lineup electrified by the end of the next decade. That’s quite the goal, and the Honda Pilot Plug-In Hybrid would be a major step forward. The 2018 Pilot features a 3.5-liter V6 engine as the sole powertrain. The addition of a plug-in hybrid powertrain would place the Pilot in a small, but competitive segment of eco-friendly vehicles. According to Automotive News, a refreshed Honda Pilot Plug-In Hybrid was caught testing in Ohio. The upcoming 2019 model features a new lower front fascia, grille, and headlight design. 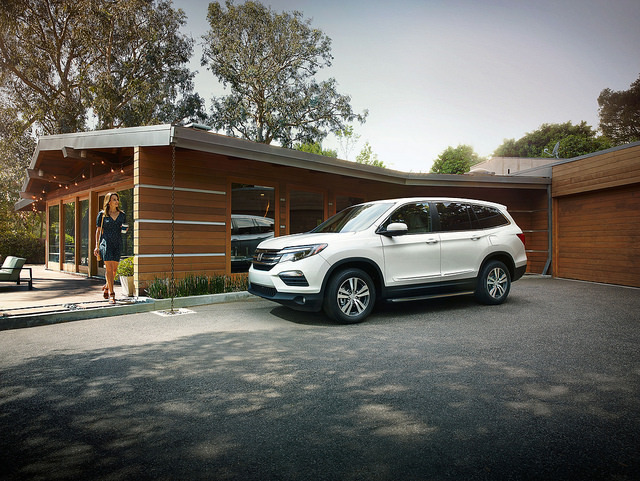 Considering that the Honda Pilot is one of the most popular midsize crossovers on the market, the addition of a plug-in hybrid variant would only increase the family model’s appeal. Although it isn’t a luxury crossover, the Honda Pilot does feature a premium design at an affordable price. Given the popularity of the Pilot, we’d love to see a plug-in hybrid variant at Hardin County Honda. Stay tuned for the latest news!